The project established the Pacific Northwest Regional Center of Excellence for Clean Energy within Washington State’s Centralia College. The acceleration of smart grid development in the Pacific Northwest region has implications for both supply side and demand side functions of the energy industry. As a result, the Pacific Northwest Center of Excellence for Clean Energy partnership will identify the workforce training needs, utilize currently developed programs and deliver workforce training to meet the needs of occupations related to smart grid. A collaboration of consumer-and investor-owned utilities, the Bonneville Power Administration, the Pacific Northwest National Lab, community colleges and universities will design and deliver educational programs for Supply-side occupations: instrument control and relay specialists; generation, load and substation operators; line workers, substation wiremen and mechanics, ground crews (utility construction workers) and Demand-side occupations: meter technicians, energy conservation program administrators and resource conservation managers and customer service representatives. Training will be provided through satellite centers in the five Pacific Northwest states (WA, OR, ID, MT and UT). Additionally, the Utah-based WestCAMP will develop safety and hazard prevention guidelines and training programs for all line workers, manufacturing and construction personnel or technicians who will be working with smart grid technologies. Through a $12 million grant awarded in 2010 by the U.S. Department of Energy, the Washington state Center of Excellence model is being replicated to serve the five partner states in the Pacific Northwest and establish energy training satellites to identify smart grid training needs across select supply and demand-side energy occupations, to improve internal job progression in utilities and to create a centralized training and recruiting portal. The grant application was endorsed by four governors, 11 U.S. Legislators representing Washington, Oregon and Idaho, and the Northwest Energy Efficiency Taskforce (NEET) Executive Board members representing the Pacific Northwest states. The center model was endorsed by NEET, a regional executive committee of 28 senior-level representatives from utilities, state government, electric customers, public interest advocates, energy efficiency companies and energy industry specialists from across the Pacific Northwest region. NEET’s 2009 Energy Workforce report charged the Center at Centralia College with leading a coordinated, strategic approach to clean energy workforce development for the region in which the center would work with regional partners to: 1) define energy efficiency jobs, 2) establish skill standards and identify job classifications for use regionally, and 3) create a regional clearinghouse for energy efficiency job openings. Deliver smart grid training for utility workers in a five state region of the Pacific Northwest. Create an online smart grid training and information portal for utilities, businesses, and consumers. Share best practices on smart grid training using a regional approach. View details about each of the boards and committees, including a roster of members. 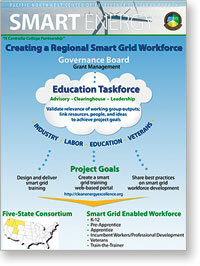 In addition to the workforce development deliverables outlined above, a portion of this grant project created consumer education materials about the smart grid concept.